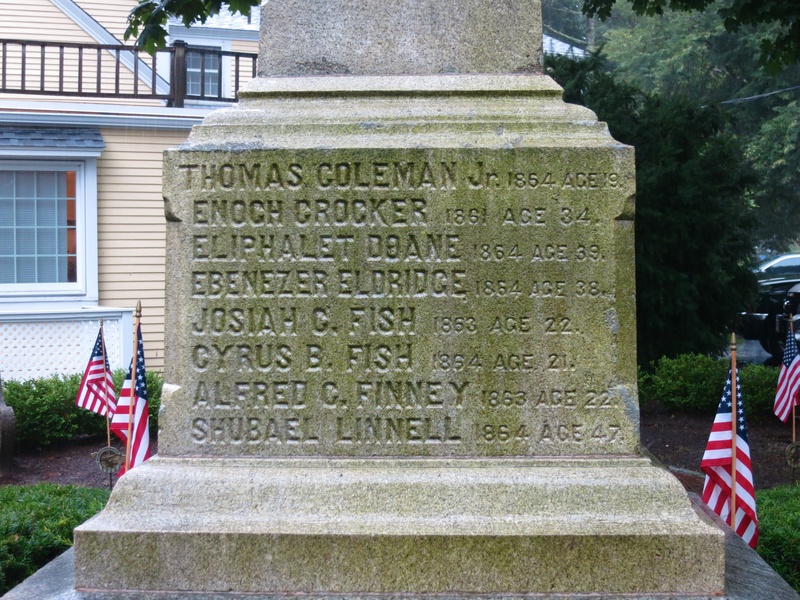 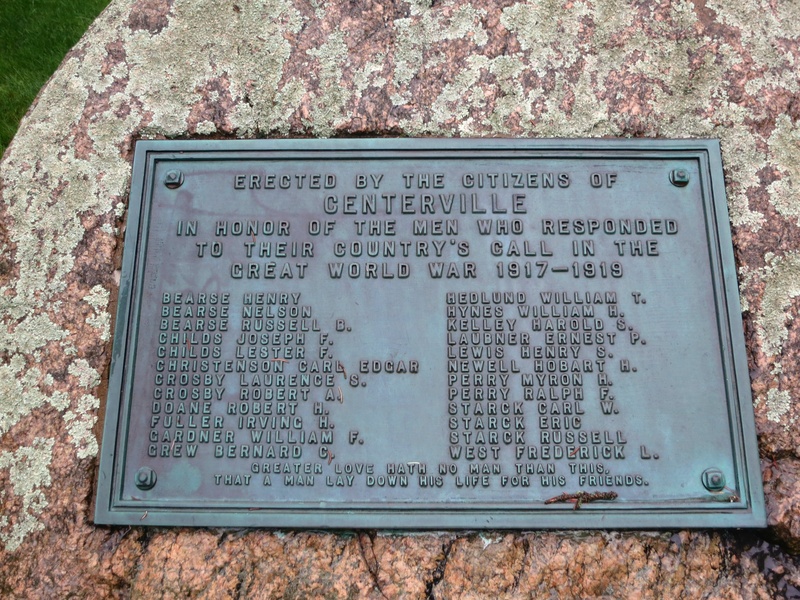 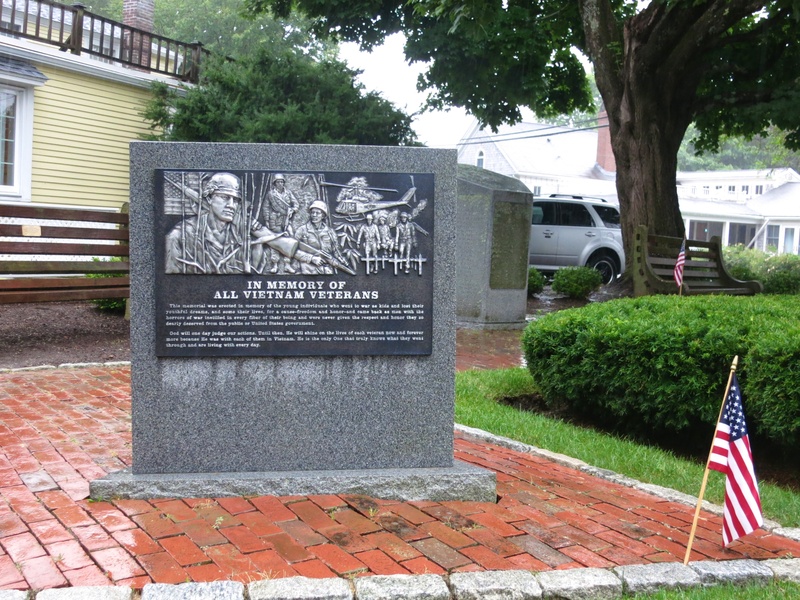 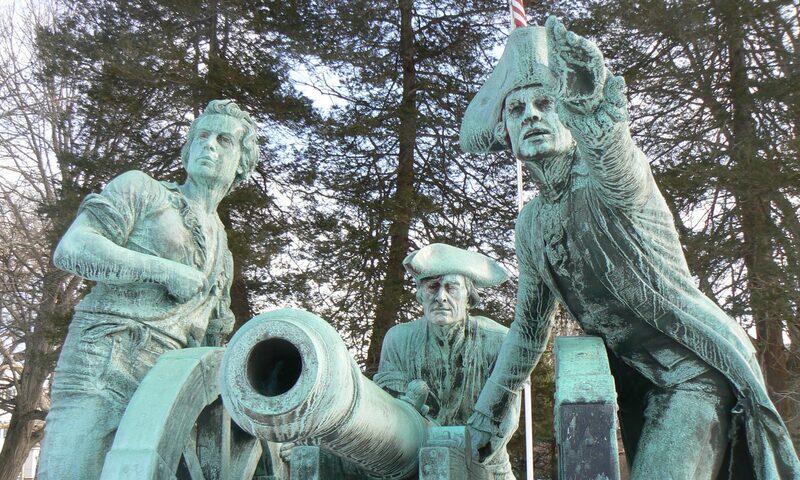 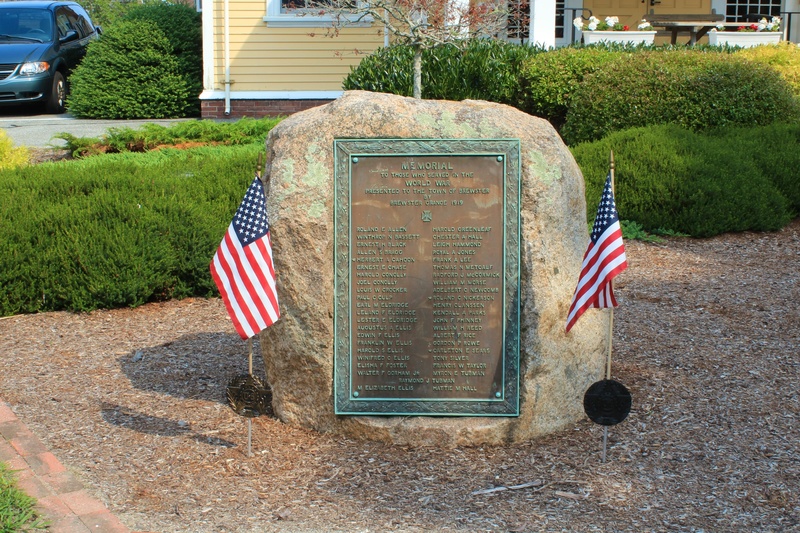 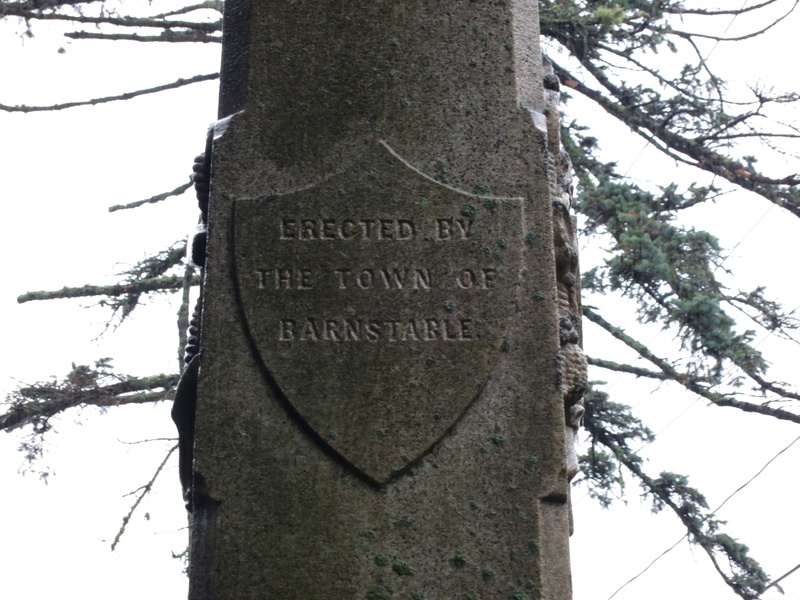 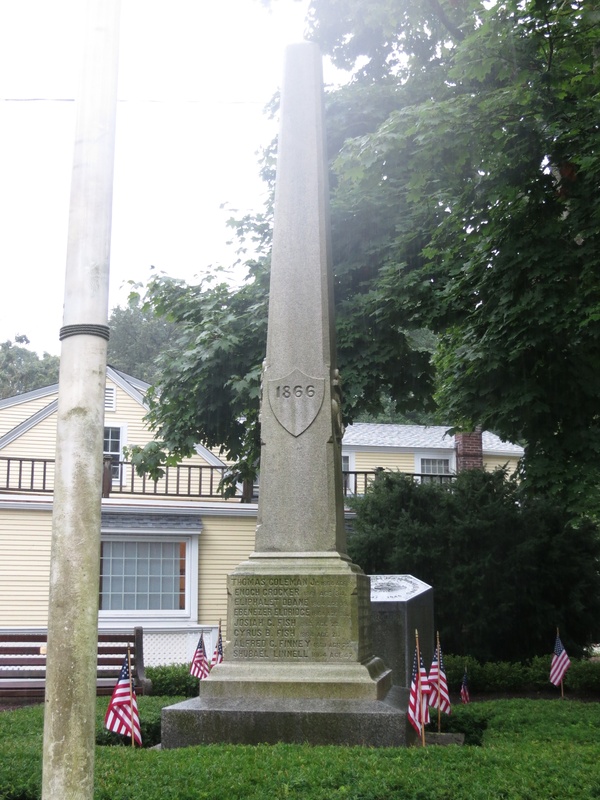 Brewster, Massachusetts, honors its local war veterans and heroes with a collection of monuments on Main Street. 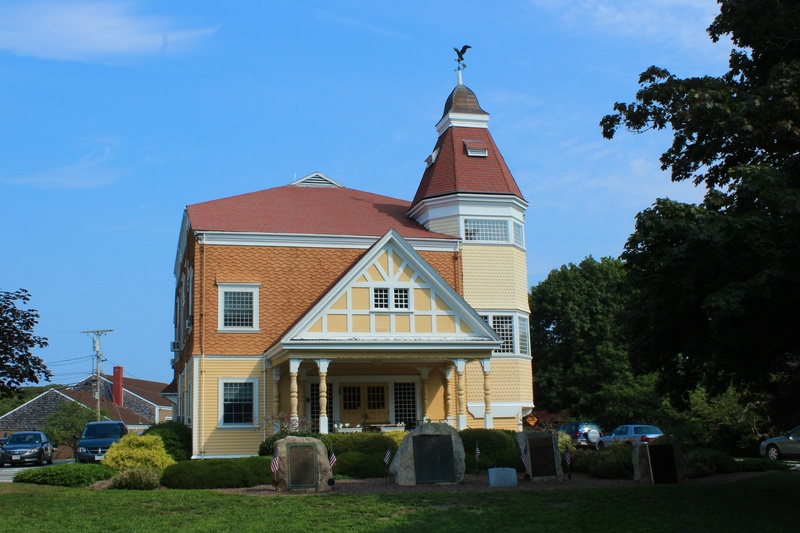 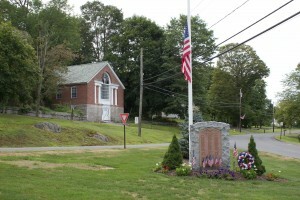 The war memorials stand in front of the town’s Council on Aging, a Victorian building on Main Street (Route 6A) that was built in 1893 as Town Hall. 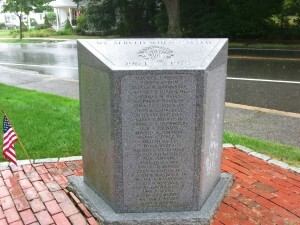 The monument lists the names of 43 residents who served in the conflict, and highlights three who died during their wartime service. 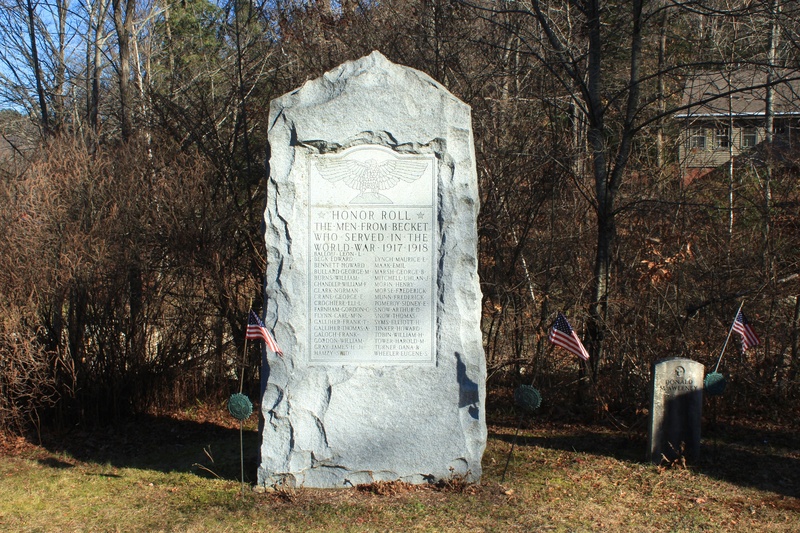 Among the dead is Roland C. Nickerson, a member of the prominent Brewster family whose land provided the basis for Roland C. Nickerson State Park. 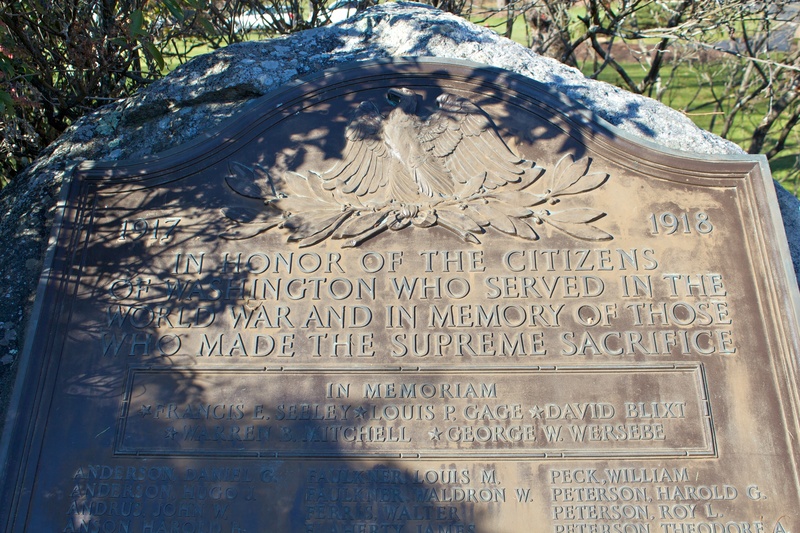 The monument also bears the names of about 120 residents, and honors four who died during the war. 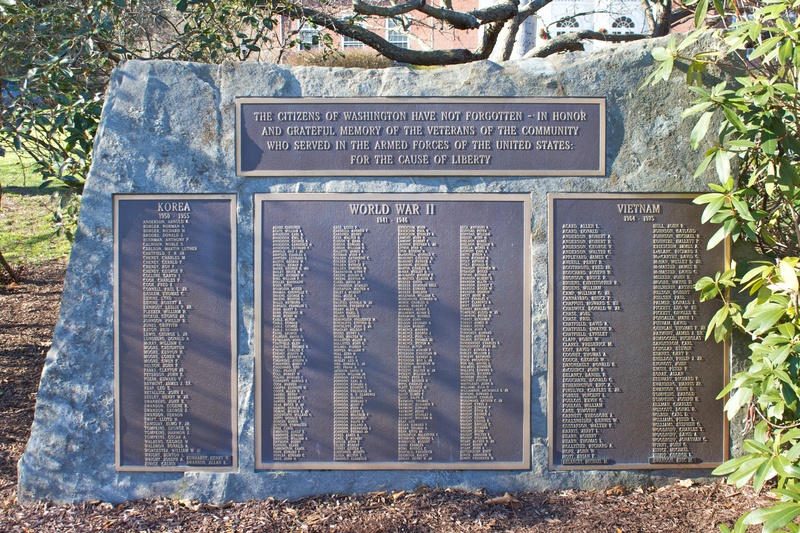 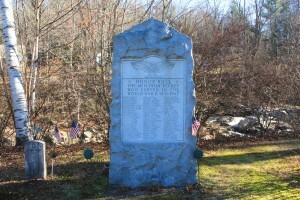 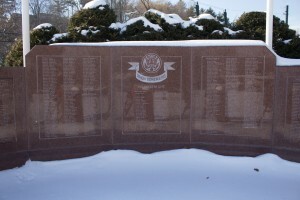 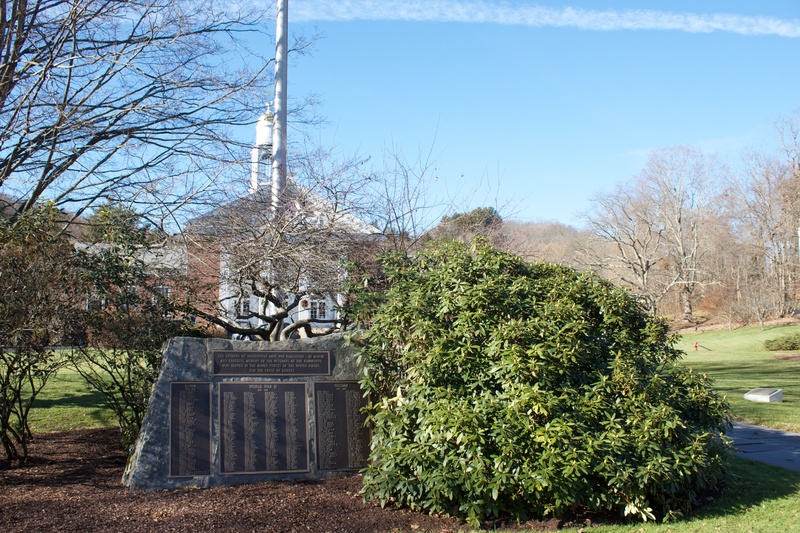 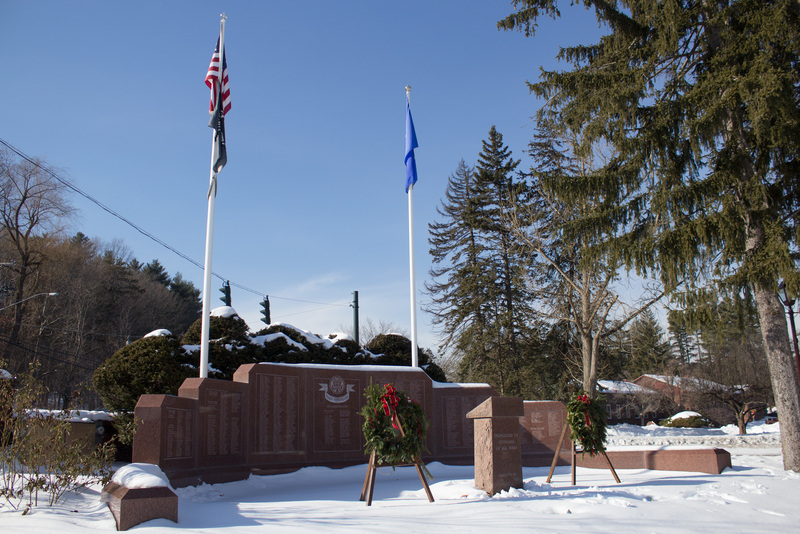 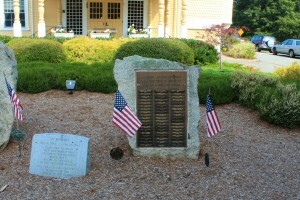 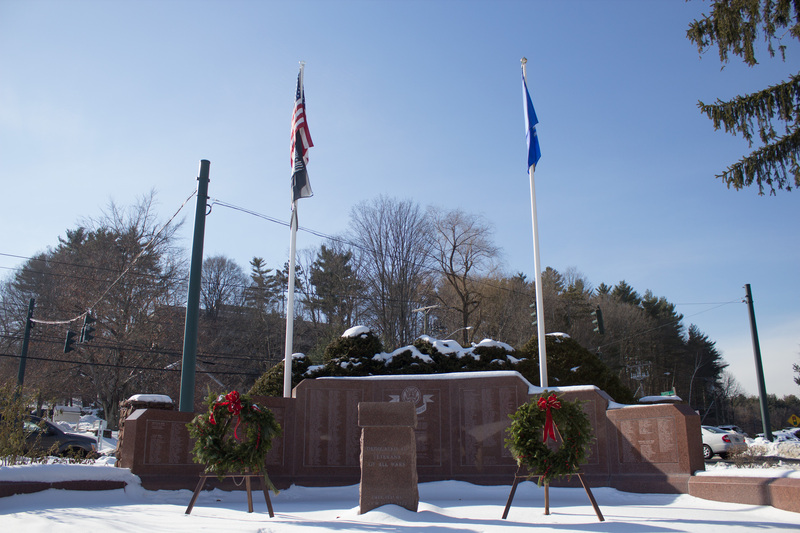 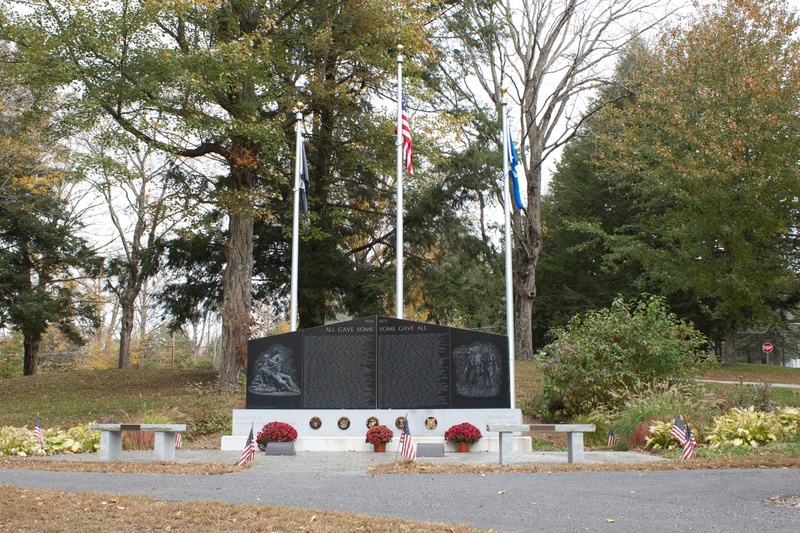 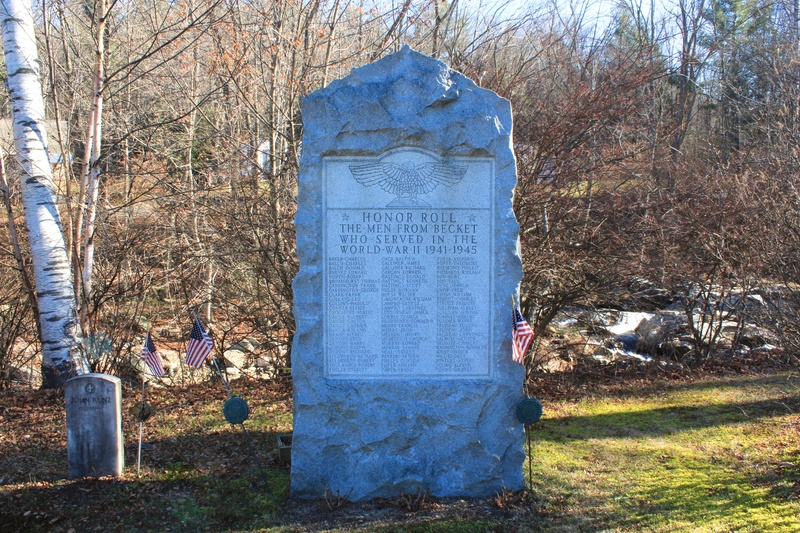 Next to the World War II monument, a smaller memorial honors Brewster residents who fought in the Battle of the Bulge. To the right of the World War II monument, a memorial honors Brewster’s veterans of the Korea and Vietnam wars. 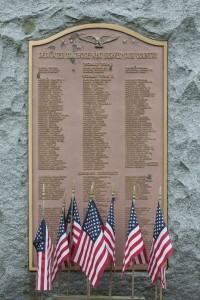 The plaque lists 57 veterans. At the far right of the memorial collection, a monument honors “veterans from Brewster who served in foreign campaigns.” The memorial doesn’t list any names, but will likely do so in the future. 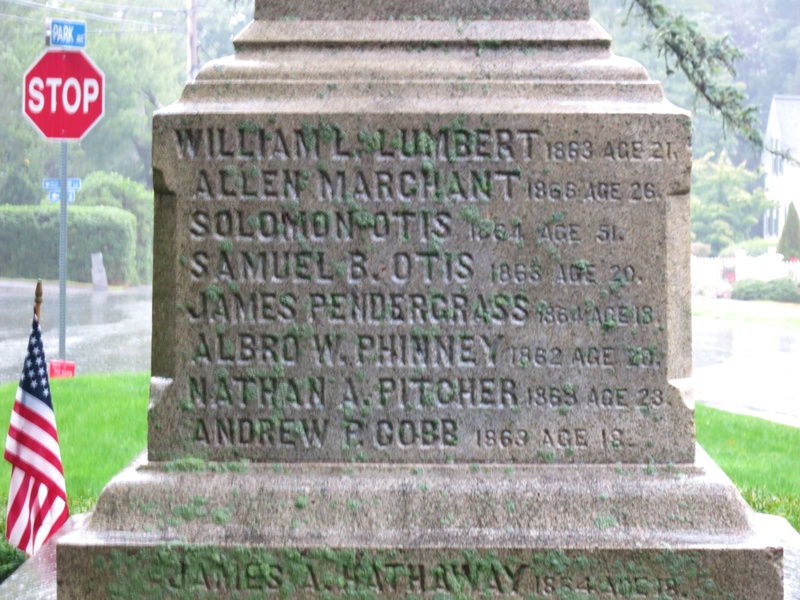 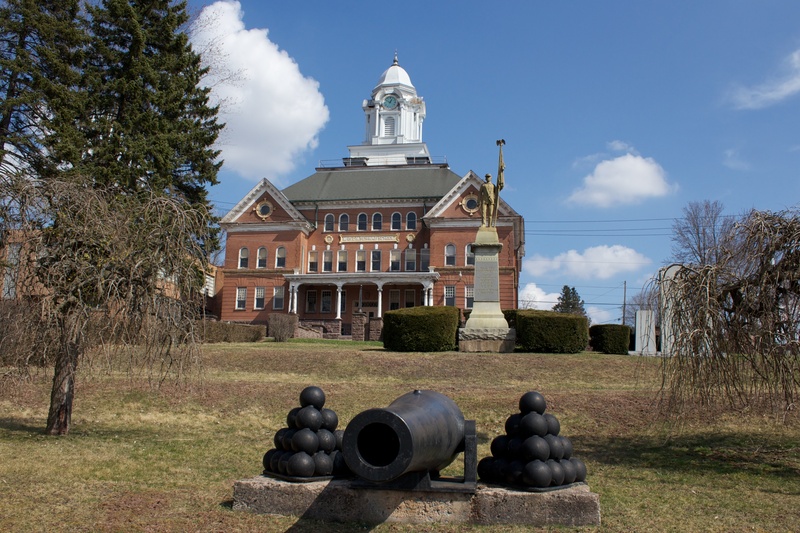 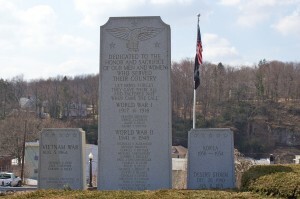 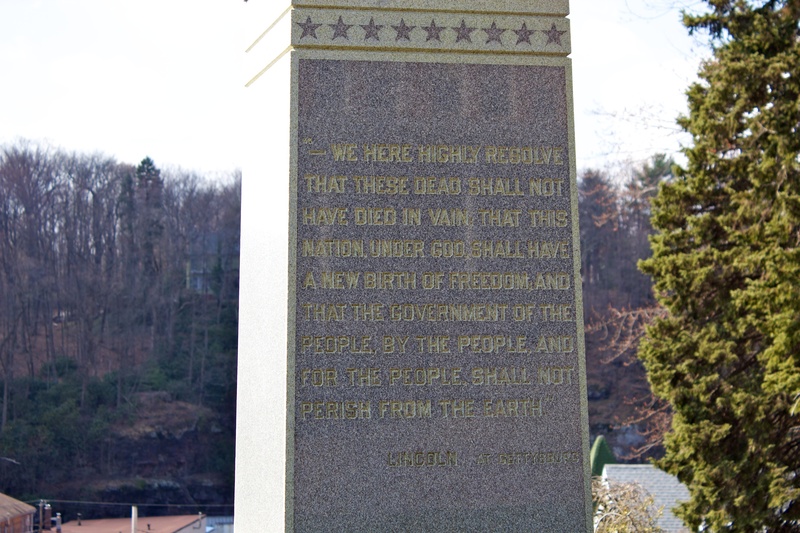 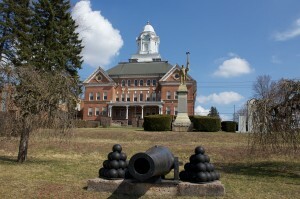 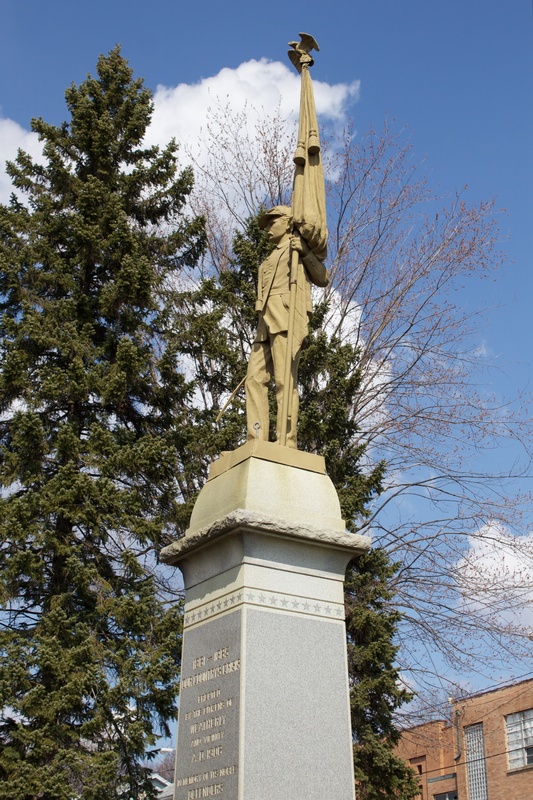 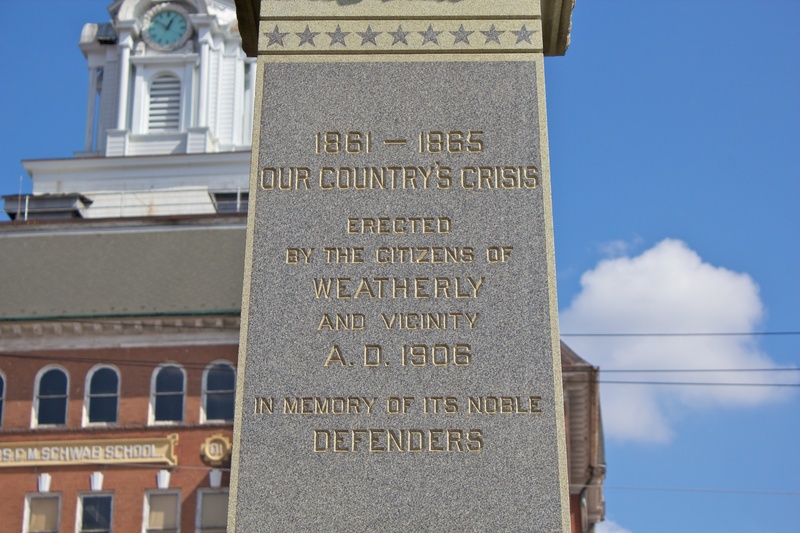 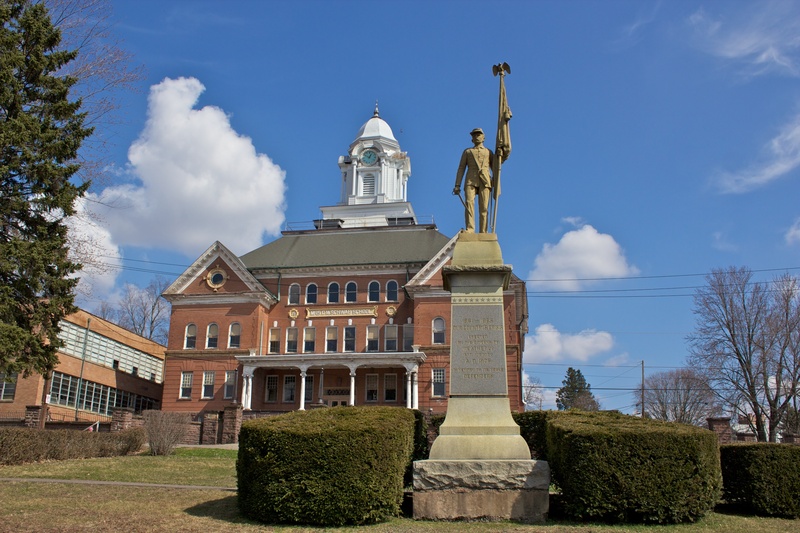 Weatherly, Pennsylvania, honors its war heroes and veterans with several monuments. 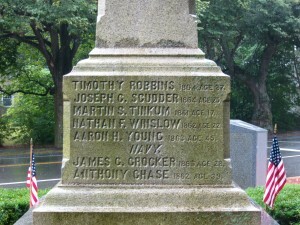 The most prominent monument on the hillside near the intersection of East Main and Spring streets is the borough’s 1906 Civil War monument. 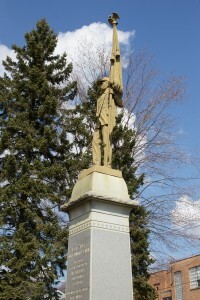 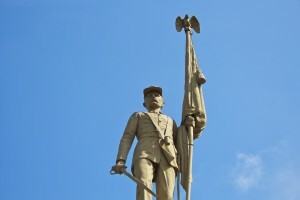 The monument features a standard-bearer holding, in an uncommon pose, an unsheathed sword. 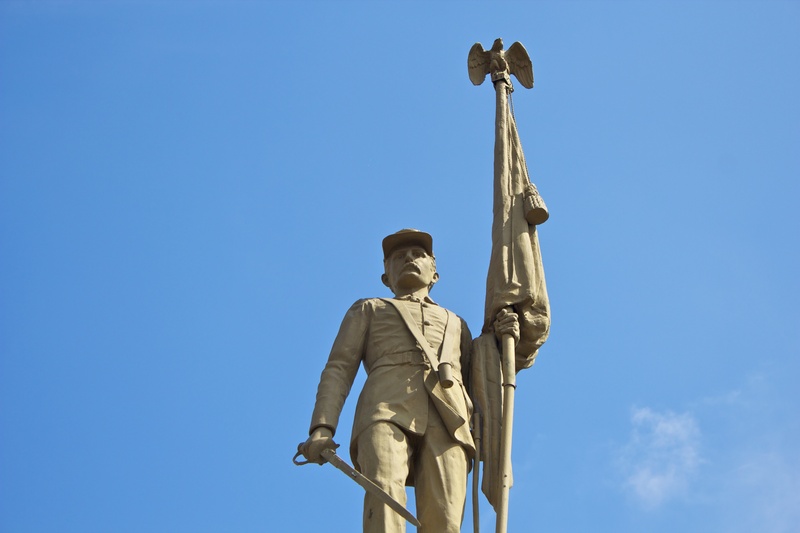 We’re not sure what material was used to create the soldier figure, but our best guess is that was cast in zinc and painted to resemble bronze. 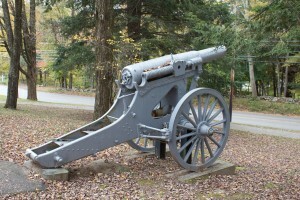 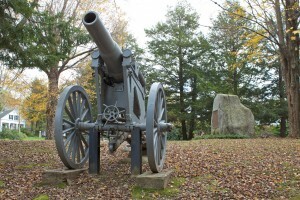 On the hillside in front of the monument, a Rodman gun is flanked by two cannonball pyramids. The hillside also features three monuments honoring Weatherly’s veterans of the two World Wars, Vietnam, Korea and Desert Storm. 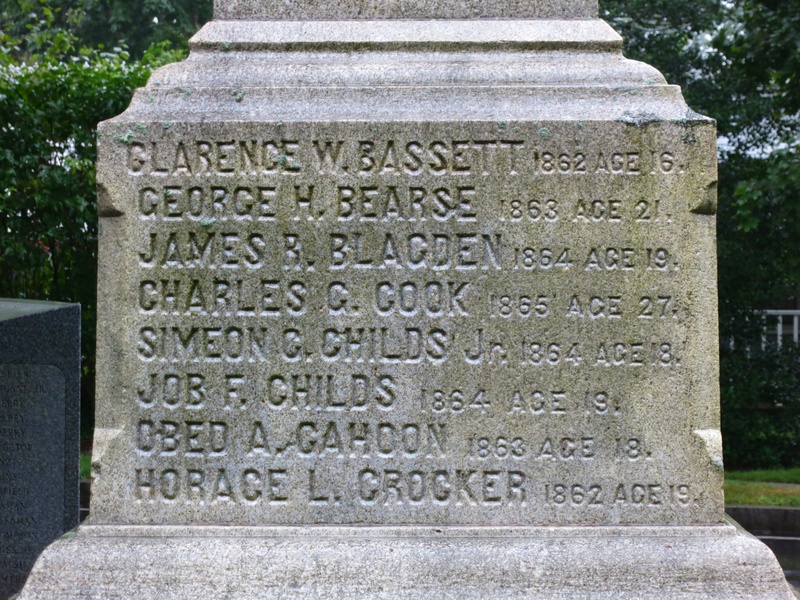 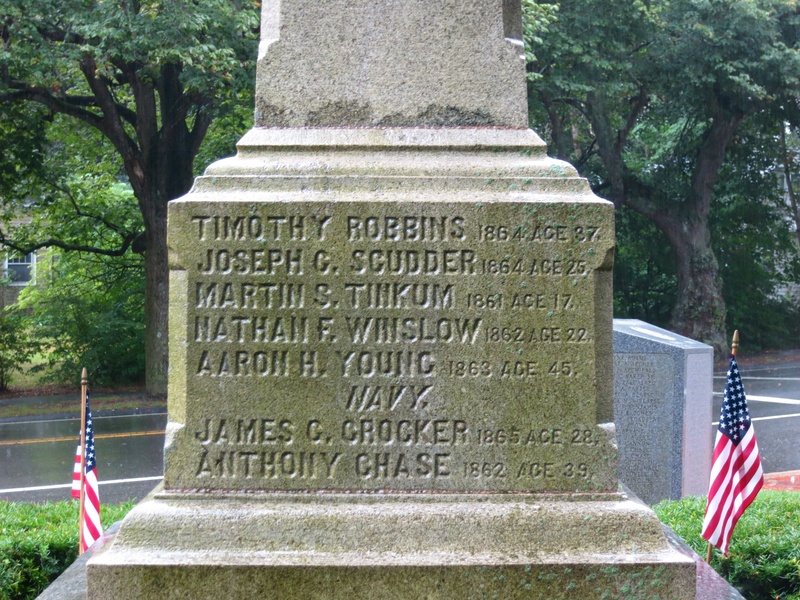 The monument’s World War I section lists four residents who died during their service, and the World War II section lists 15 names. 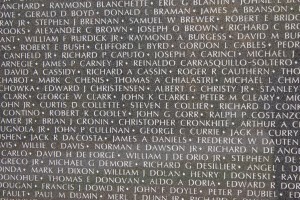 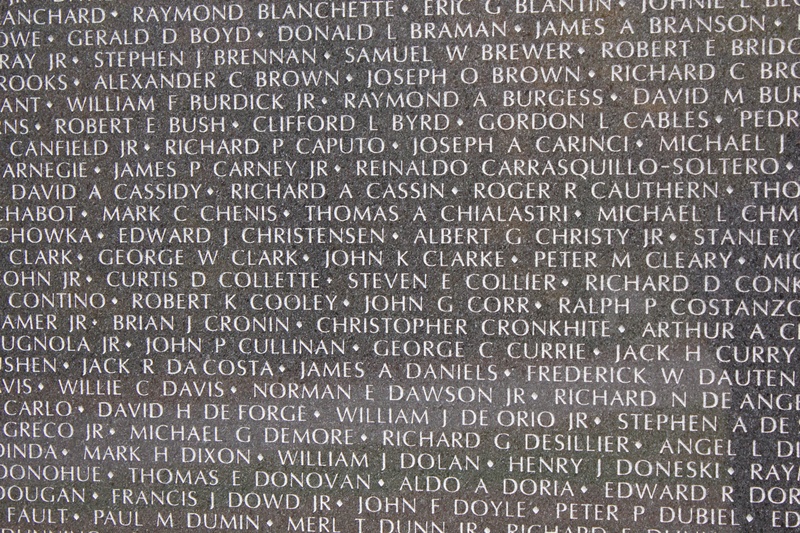 The Vietnam memorial lists three residents who died in the conflict and one who was reported missing in action. 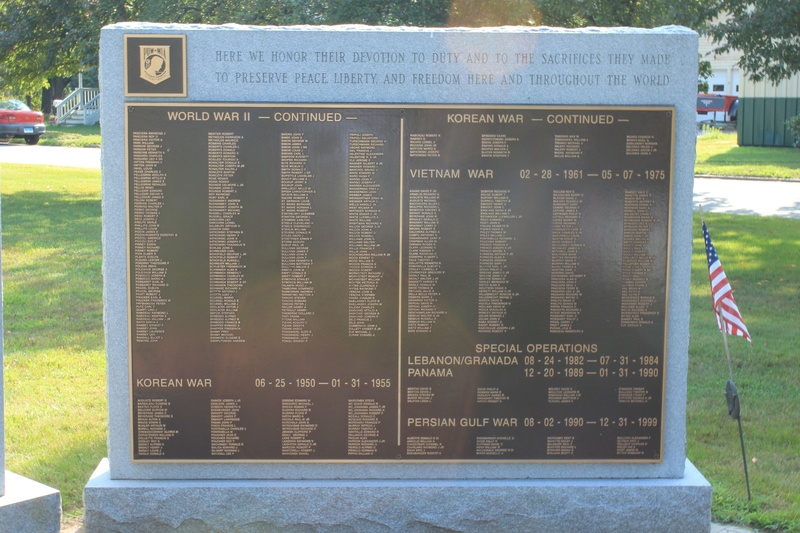 Memorials to the Korean War and Operation Desert Storm do not list any local casualties. The large school building in the background was donated to the town in 1903 by Bethlehem Steel president Charles M. Schwab and named after his wife, a Weatherly native. The building originally served all grades, and was expanded in 1936. 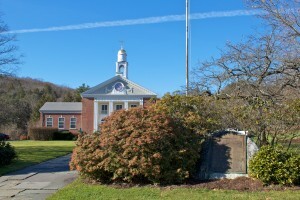 Separate elementary and middle schools were built over the years, and the borough closed the Schwab school after opening a high school in 1990. 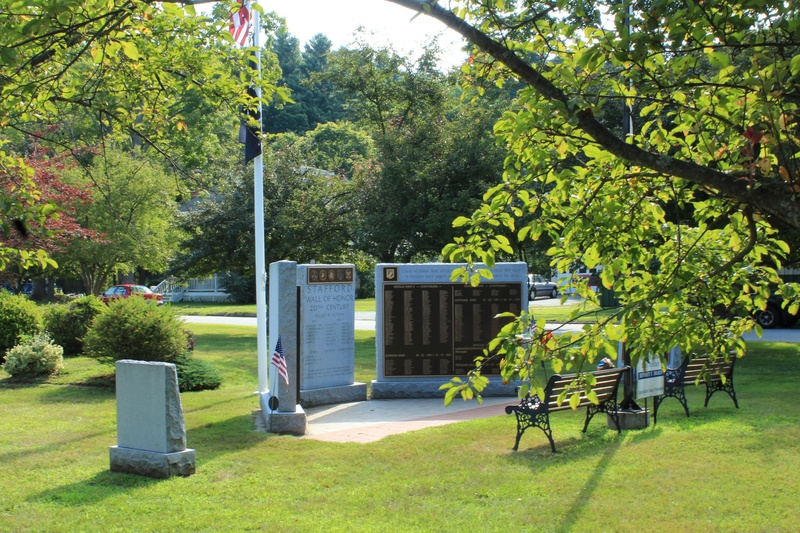 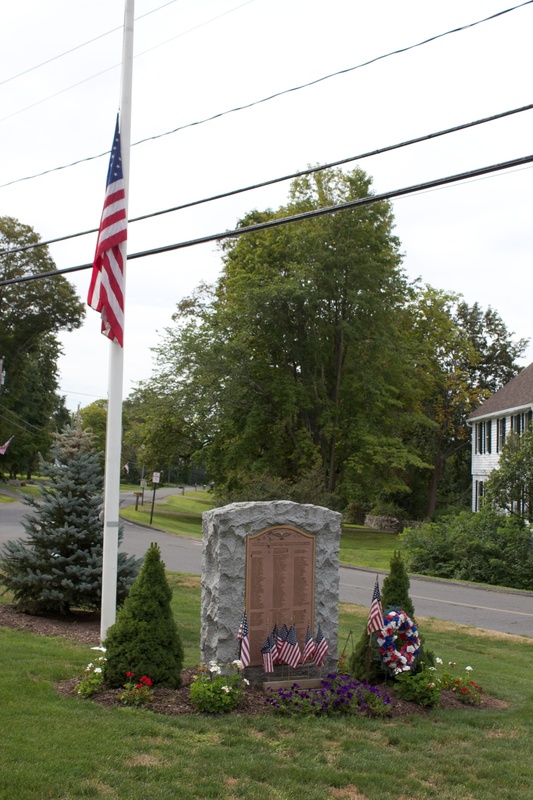 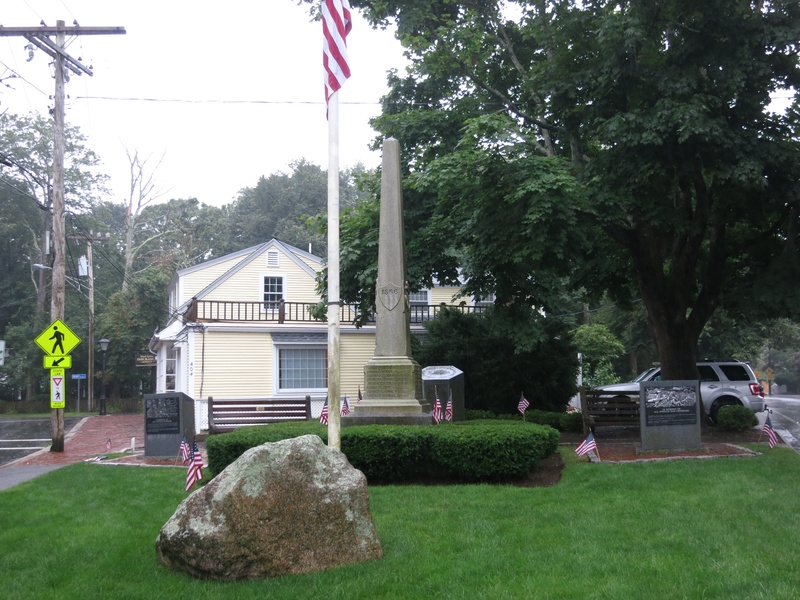 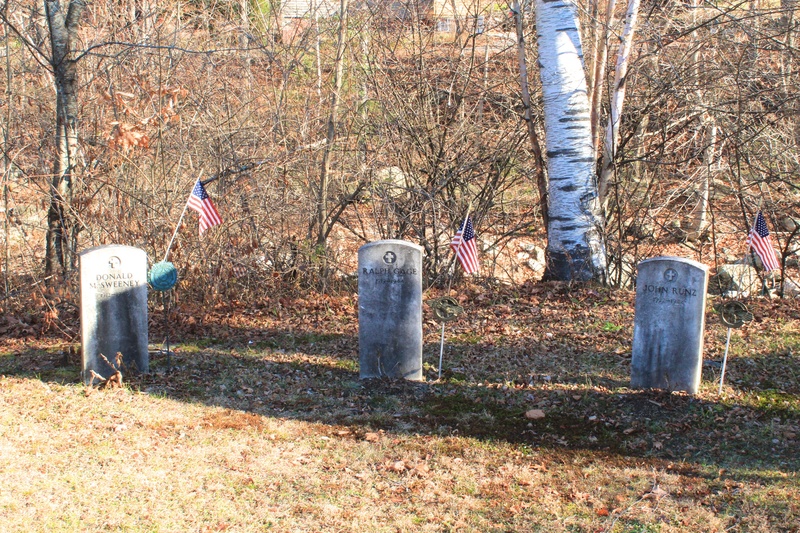 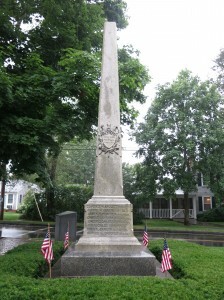 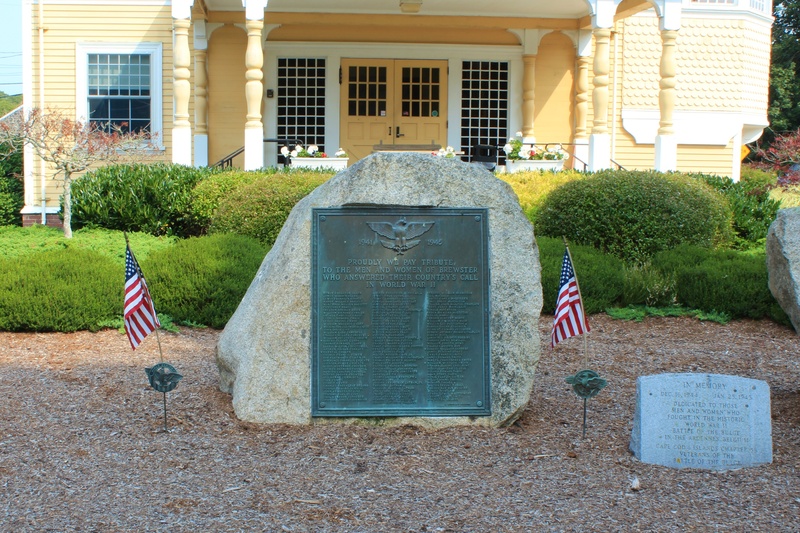 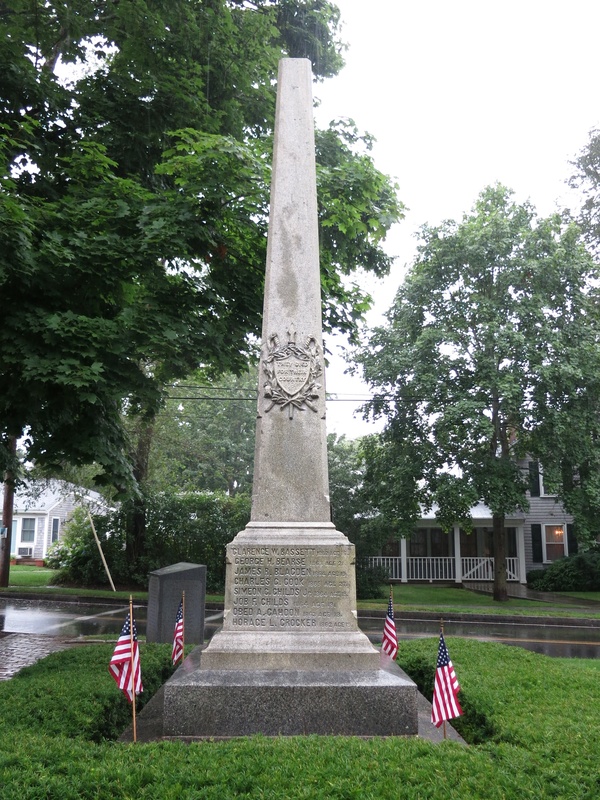 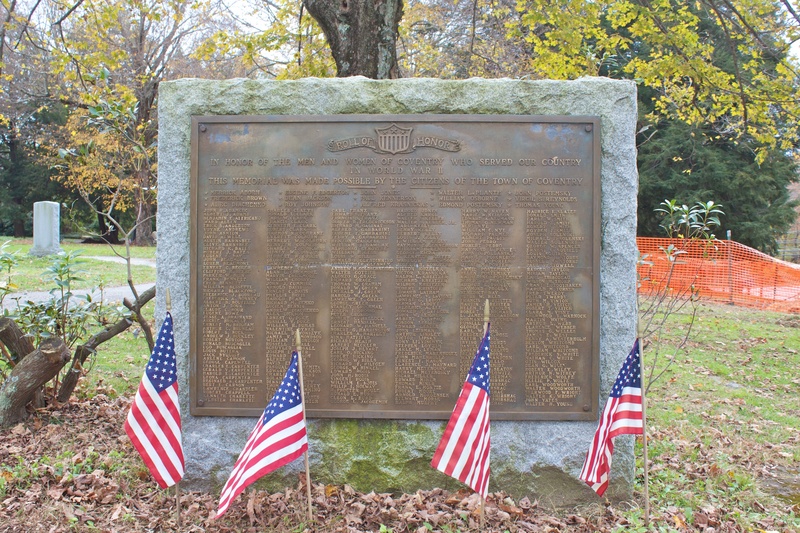 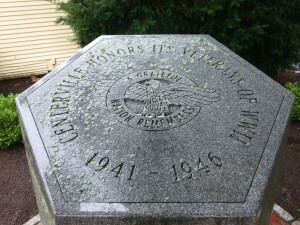 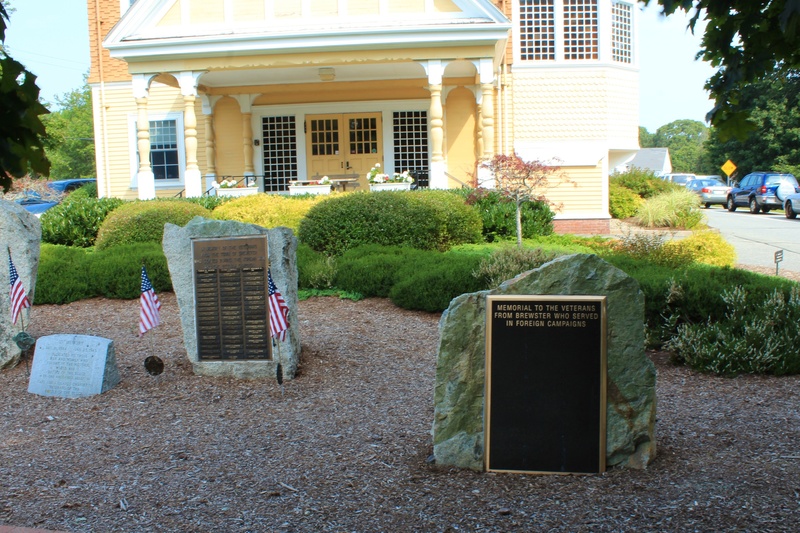 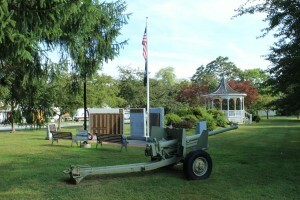 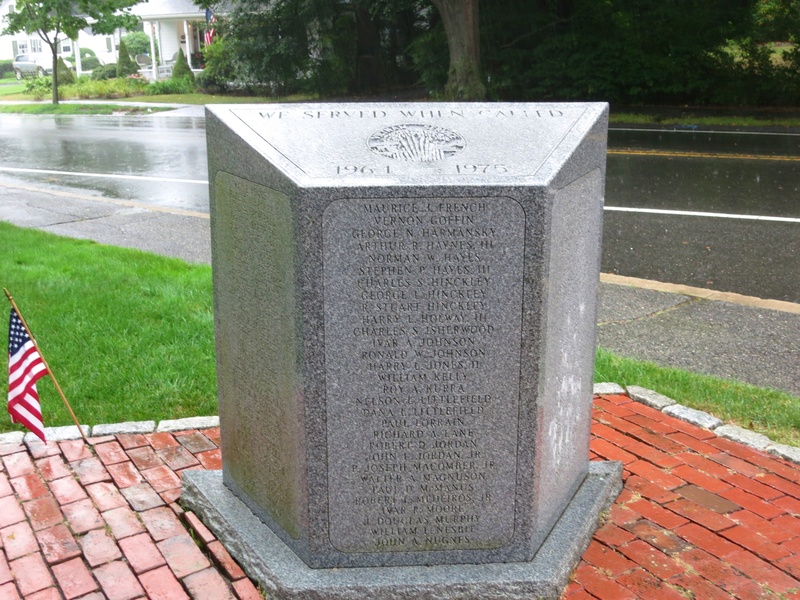 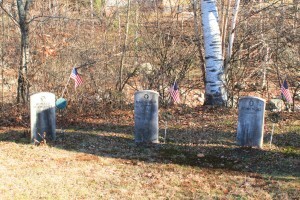 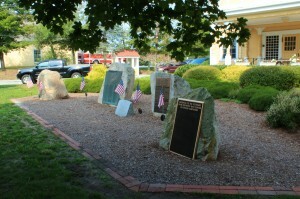 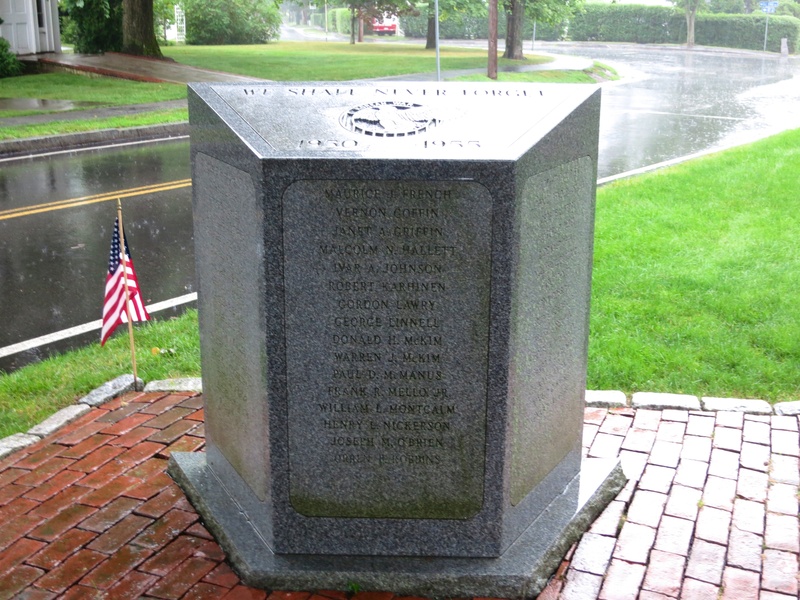 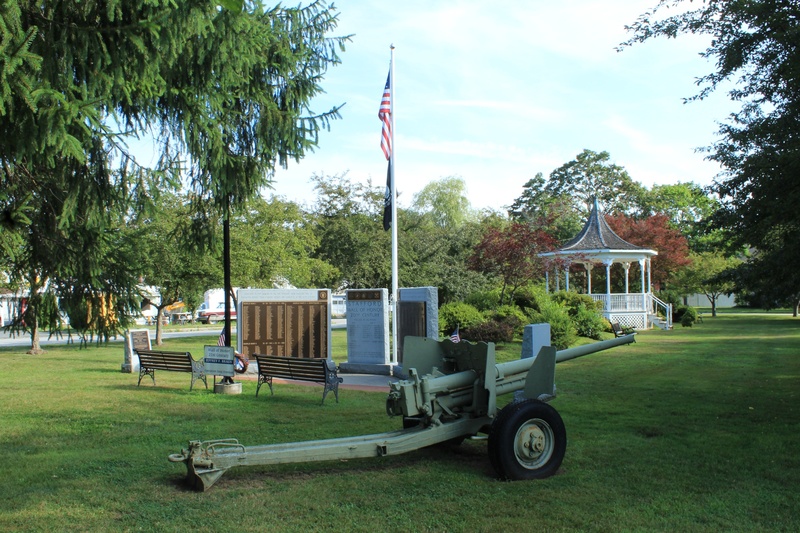 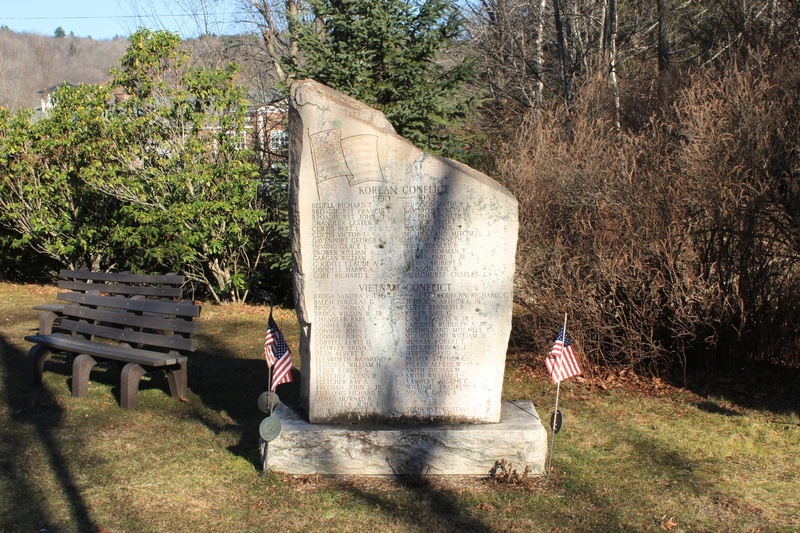 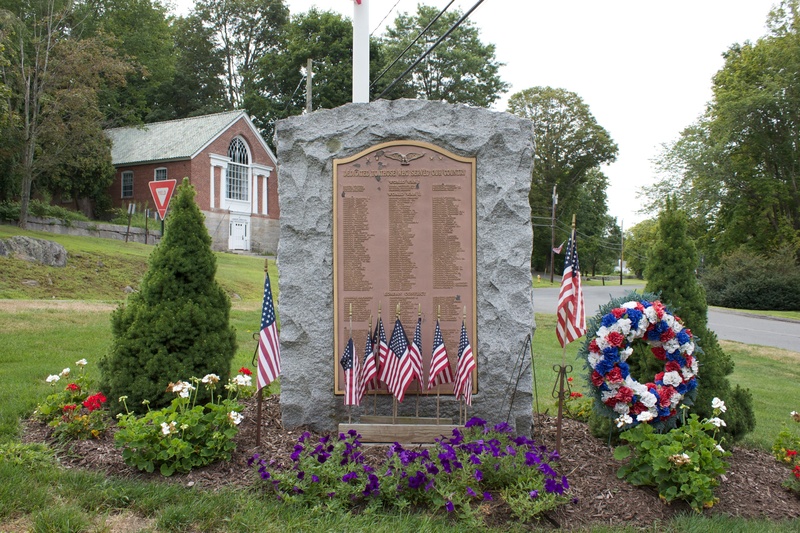 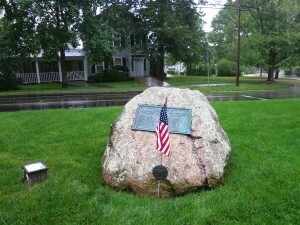 Coventry honors veterans of several wars with monuments on the town’s historic green. Veterans Memorial Green, along Lake, High and Cross streets, is a former militia ground used for training during the American Revolution, War of 1812 and the Civil War. 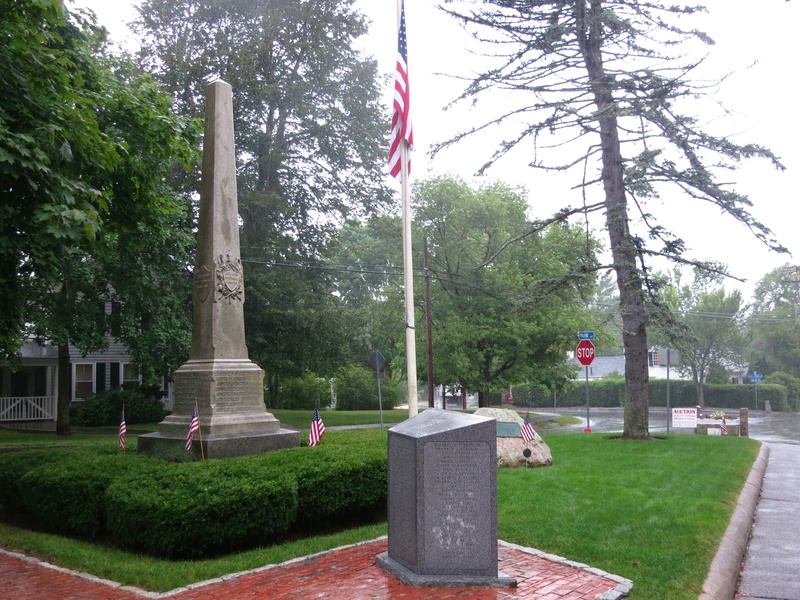 Today, the green features six monuments, and ground has been broken for a statue of Nathan Hale that is scheduled for dedication later this year. 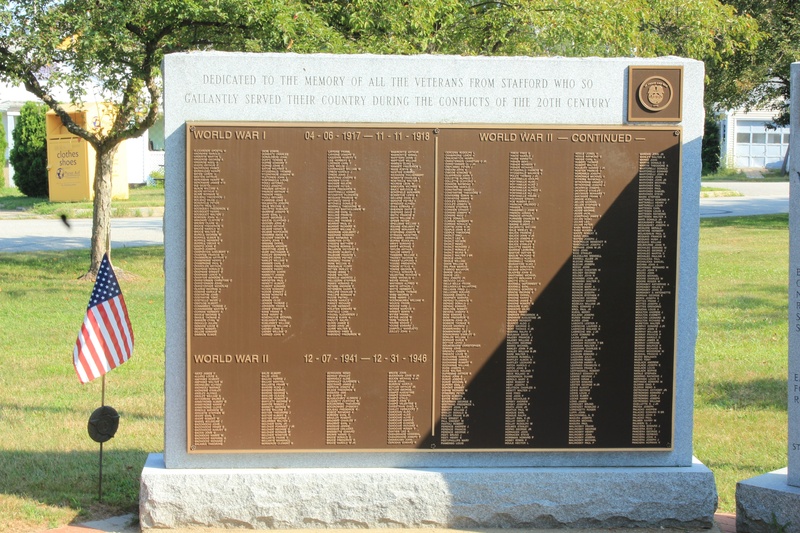 The memorial lists the names of 321 residents who served in World War II and highlights 15 who died during their service. 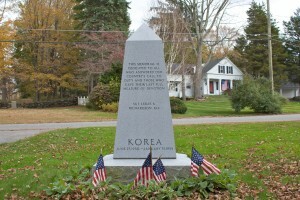 The monument lists one resident who was killed while serving in Korea. 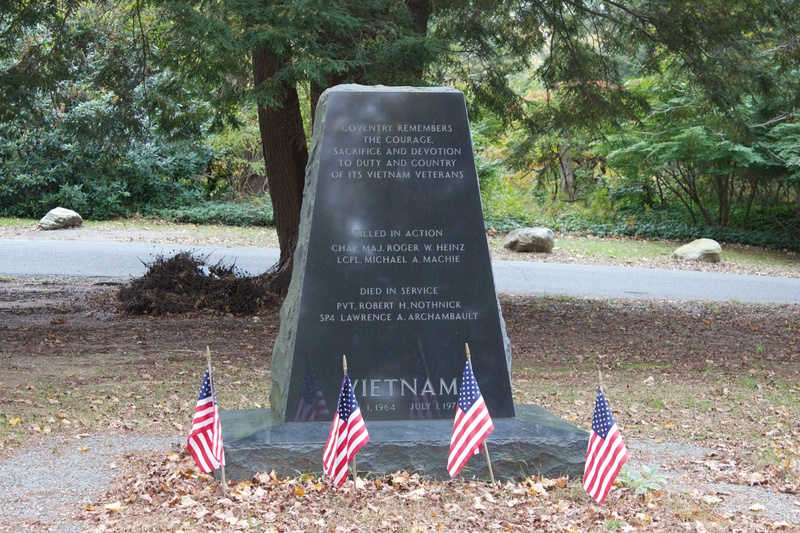 The monument lists two residents who were killed in action, and two others who died while serving in Vietnam. “On this historic military training ground, men assembled in the Colonial Wars, War of the American Revolution, the War of 1812 and the Civil War. 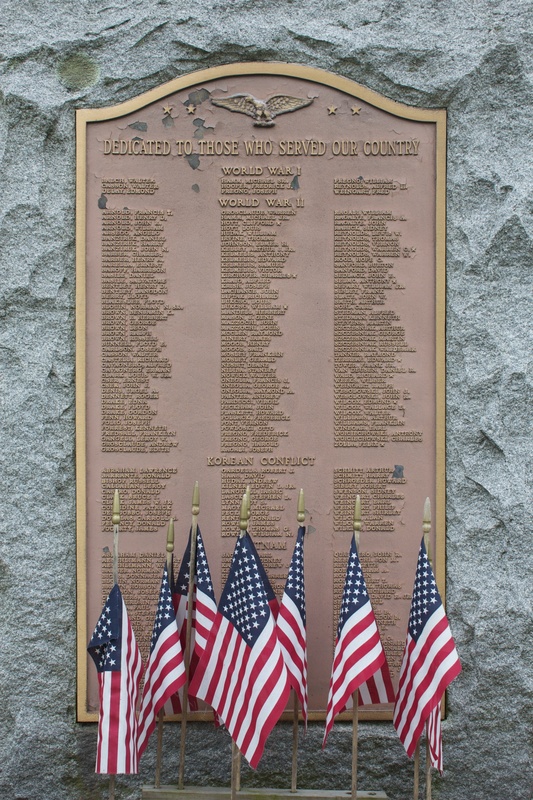 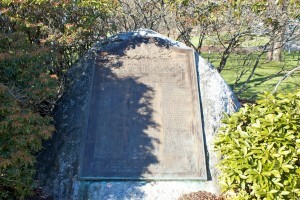 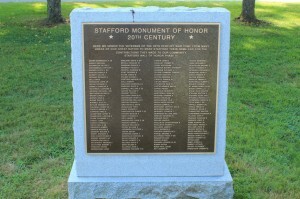 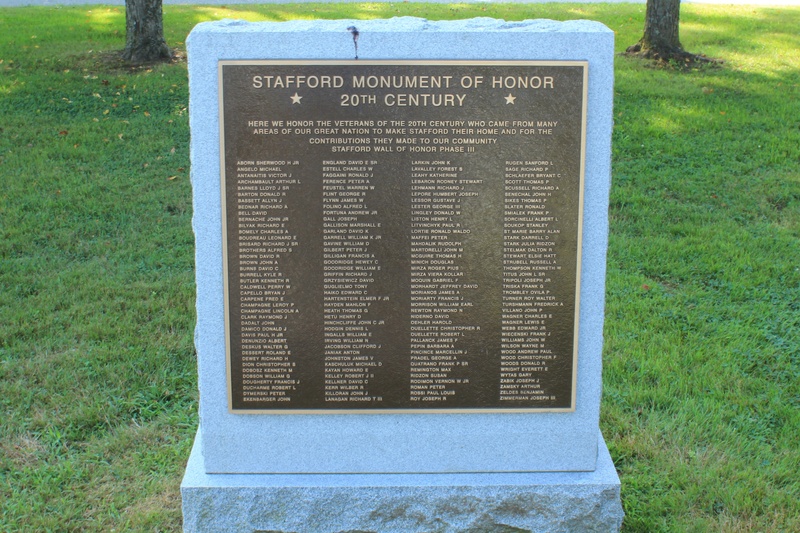 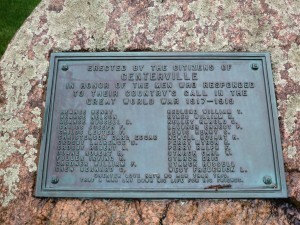 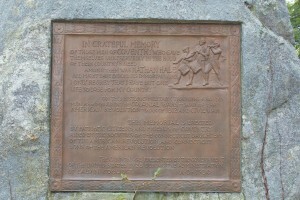 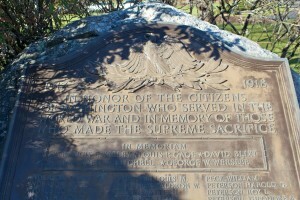 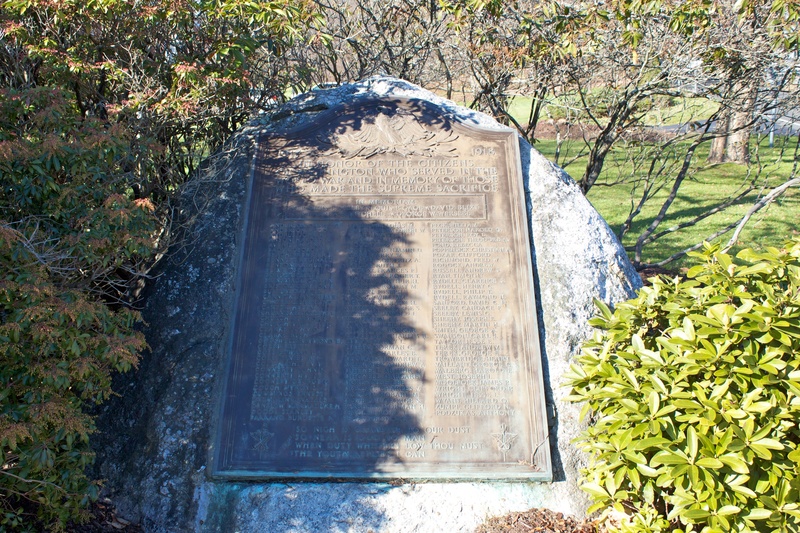 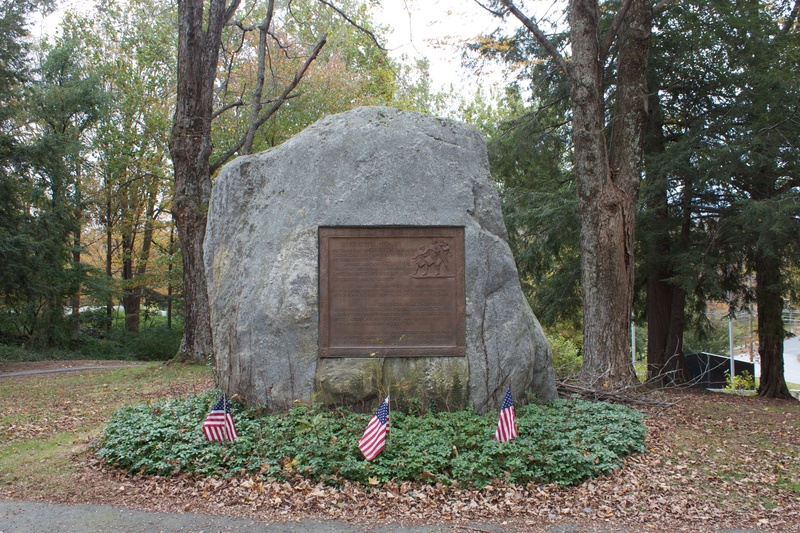 “This memorial is dedicated by patriotic citizens and friends of Coventry, aided by the societies of the Connecticut Daughters of the American Revolution and Connecticut Sons of the American Revolution. 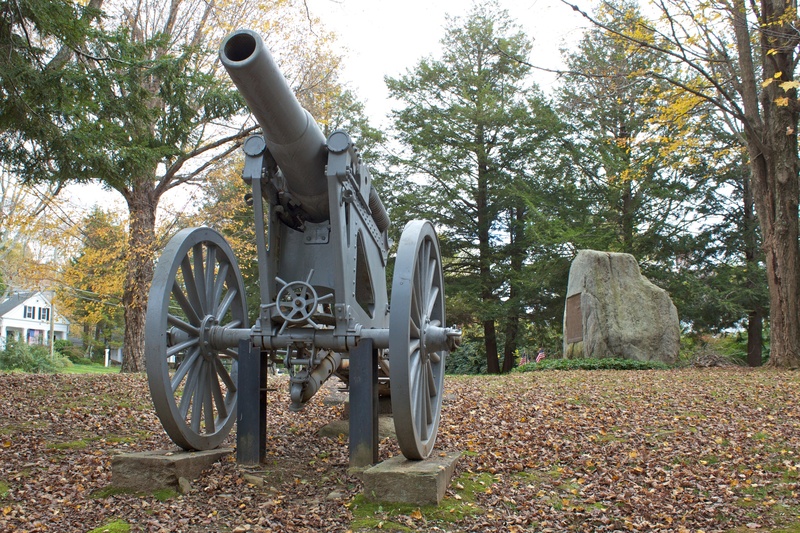 The cannon referenced on the Memorial Boulder was built in 1896 by the Rock Island Arsenal in Illinois, which today manufactures military tools and combat equipment. 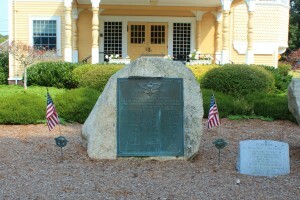 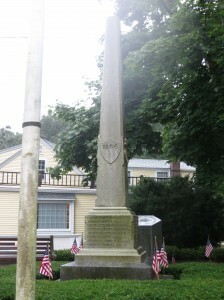 The Coventry Green also features a 1998 memorial to French soldiers who fought for American independence. The monument provides a short summary of the decisive support the French military provided to the Continental Army, and highlights seven French soldiers who died of smallpox and were buried in Coventry in 1781. The southern end of Veterans Memorial Green hosts Connecticut’s Vietnam Memorial. 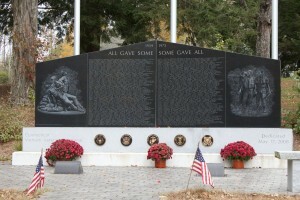 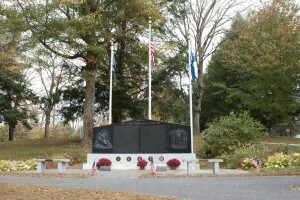 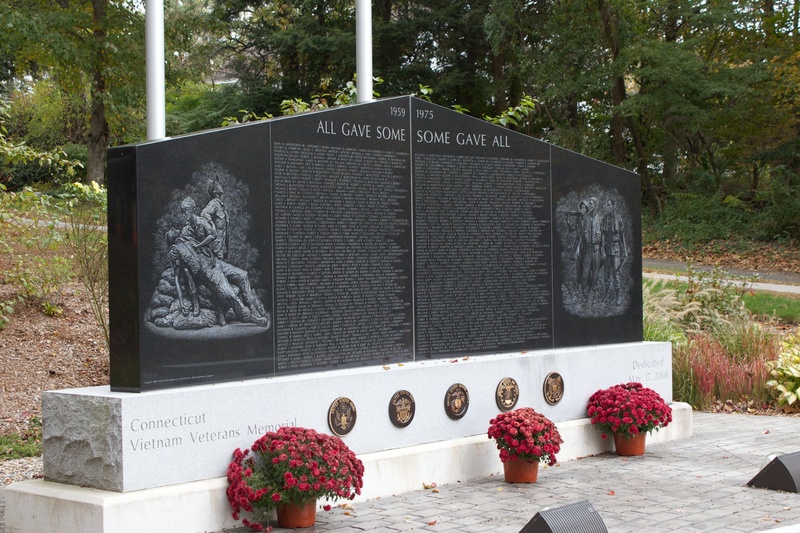 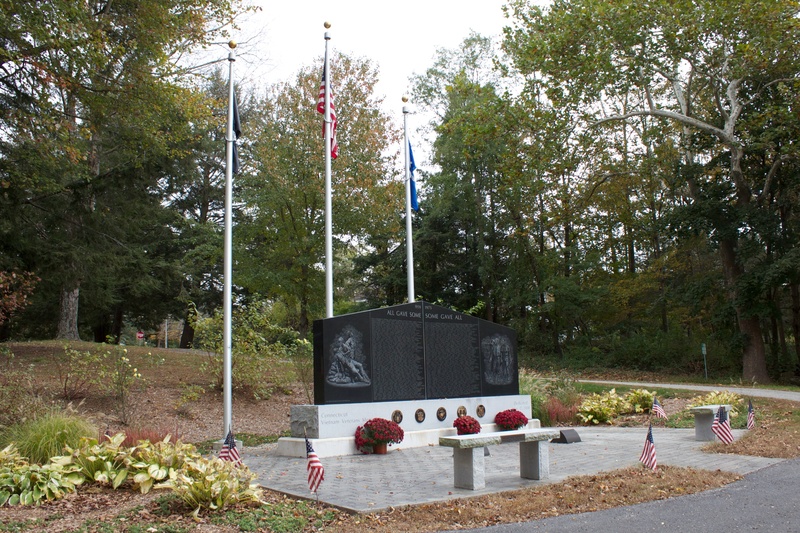 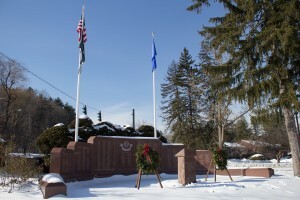 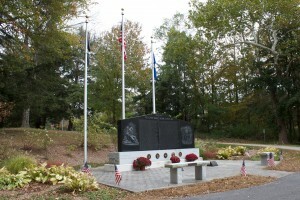 The Connecticut Vietnam Memorial, on Coventry’s Veterans’ Memorial Green, was dedicated in May of 2008 to honor the 612 state residents who died during the Vietnam War. 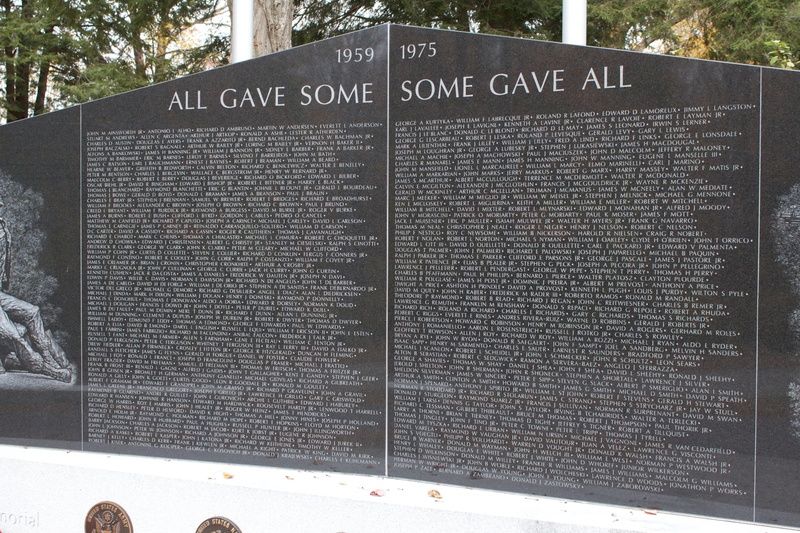 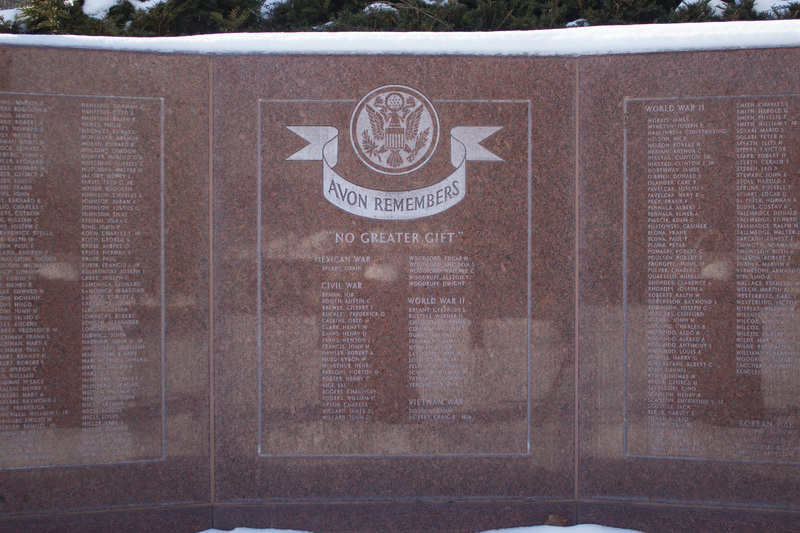 The memorial, near the intersection of Lake and Cross streets, features four black granite panels, with the center two panels listing the names of the state’s Vietnam heroes. 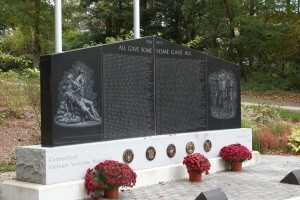 The memorial’s base bears bronze service emblems from the various military branches. 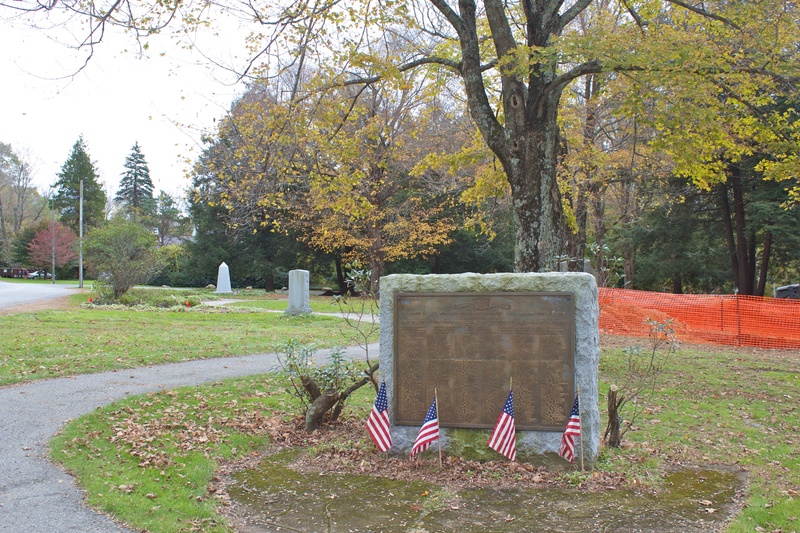 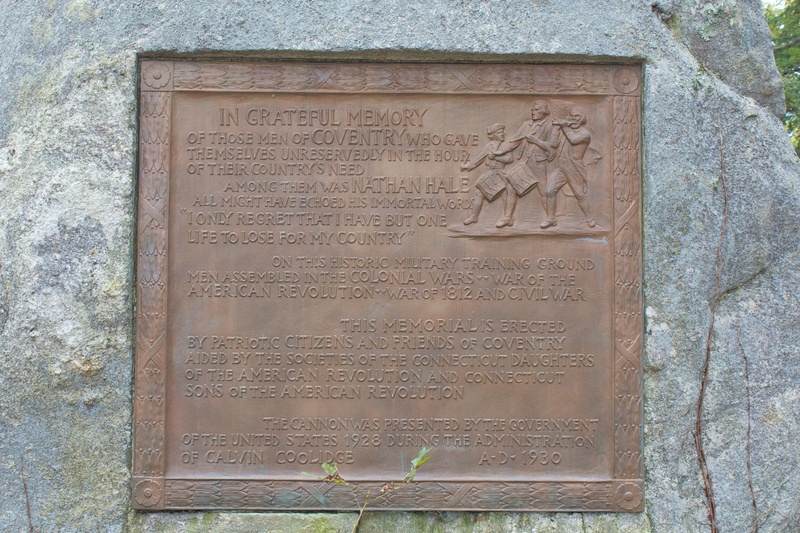 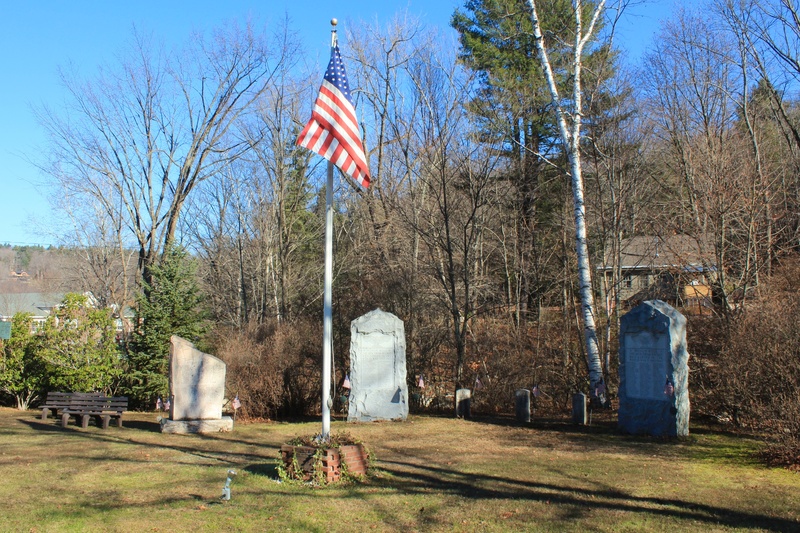 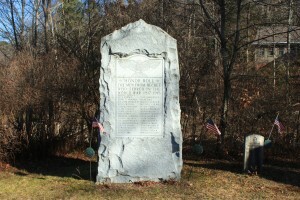 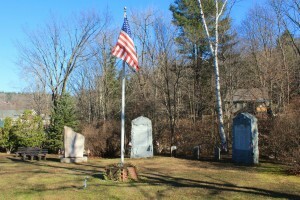 Efforts to build the monument began in 2001, when students at Coventry’s Nathan Hale Middle School began a project to compile biographical information about Connecticut veterans who died in the war. 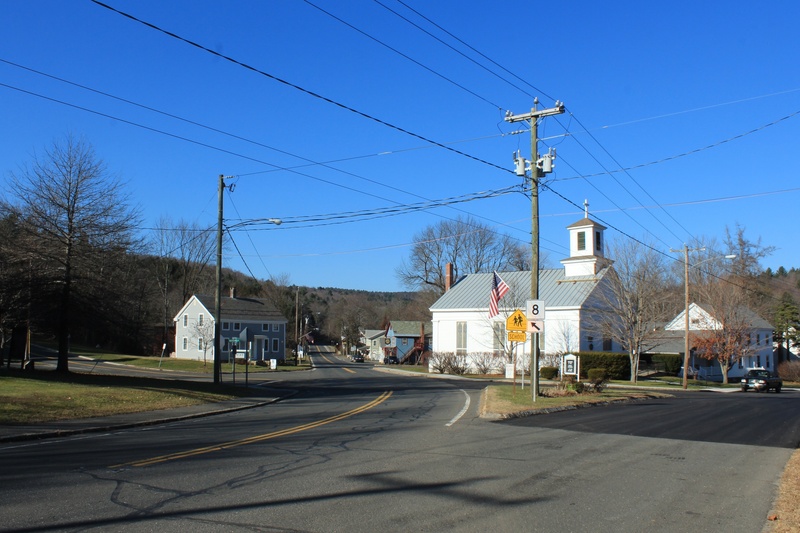 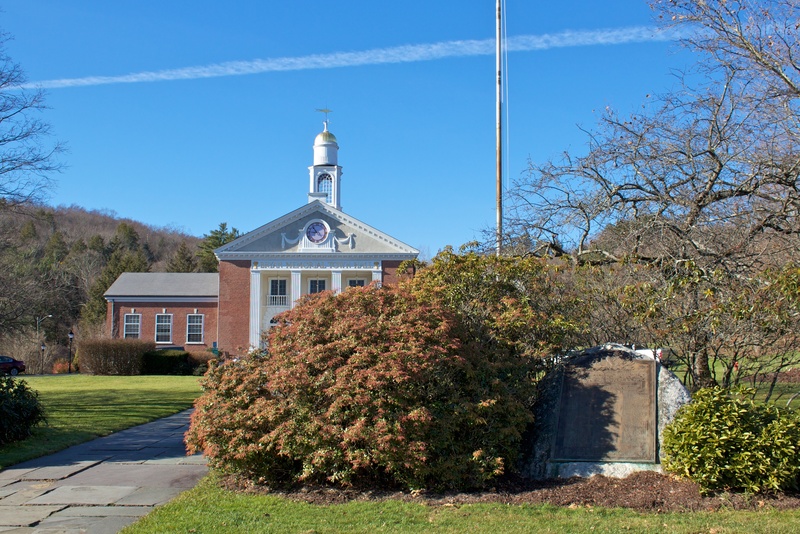 The middle school project inspired local efforts to build a permanent memorial to the war heroes, and the town of Coventry agreed to provide land on the Memorial Green. 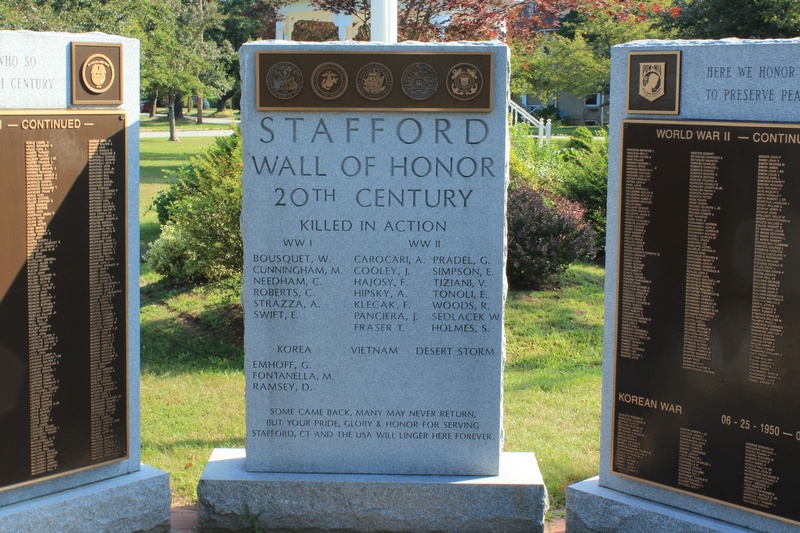 Students at Coventry High School are collecting photographs of the state’s Vietnam heroes as part of the “Call for Photos” campaign being coordinated by the Vietnam Veterans Memorial Fund. 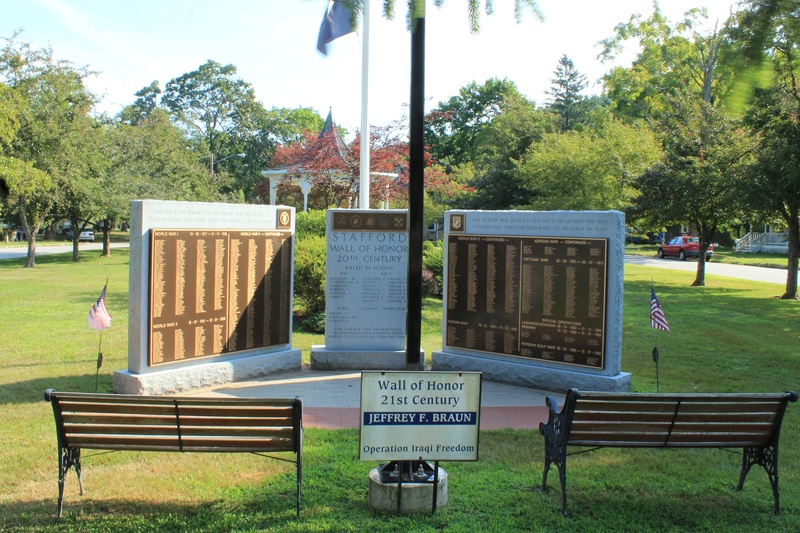 The photos will be part of an interactive display in an education center planned for Washington, D.C.
Harwinton honors its veterans of the World Wars, Korea and Vietnam with a monument on an historic green. 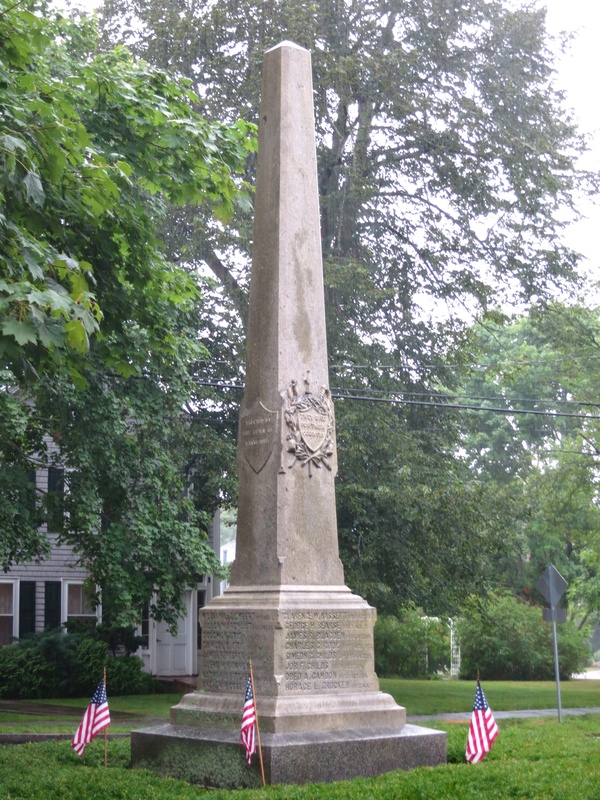 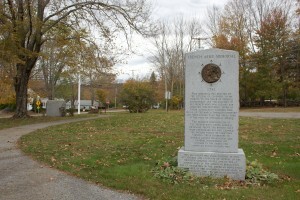 The undated monument, near the intersection of South Road and Litchfield Road (Route 4), stands near the north end of the green. 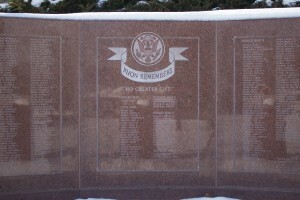 Beneath the dedication, a section dedicated to World War I veterans lists nine names. 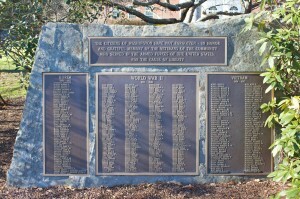 A section listing World War II veterans includes 137 names, and honors nine who died during their World War II service. 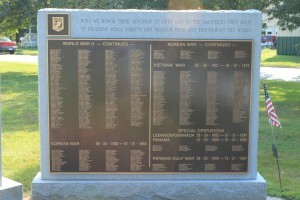 The monument also lists the names of 37 residents who served in Korea, and 80 who served in Vietnam. 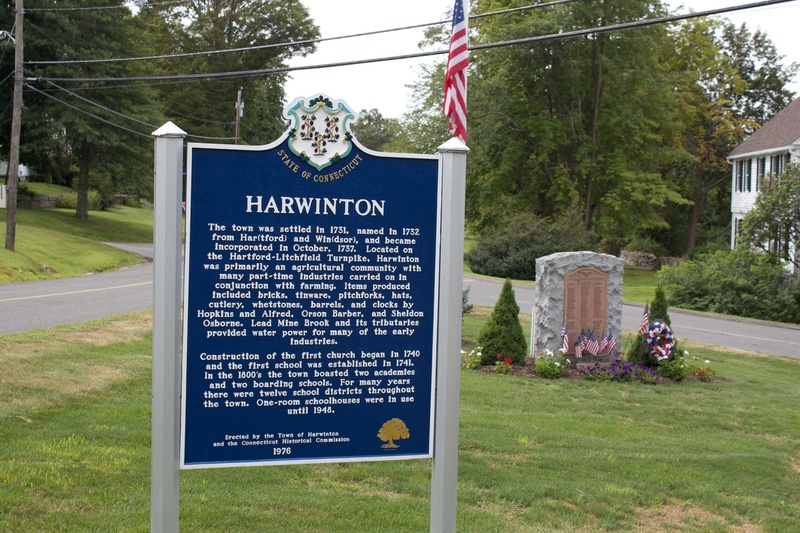 To the northeast of the monument, a 1976 historic marker erected by the town and the Connecticut Historical Commission provides a brief history of Harwinton. 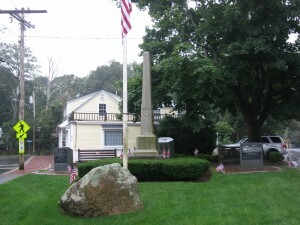 To the east of the monument, the brick building in the left background of some photos is the 1915 Community Hall, which replaced a building erected around 1840. 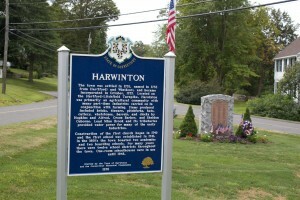 The original building served as Harwinton’s Town Hall and an Episcopal Church. At the western edge of the green (part of the Litchfield-South Roads Historic District) stands a 2006 replica of a signpost that has stood, in one form or another, on the location for more than 200 years. 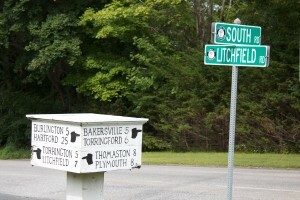 In addition to directions and distances to nearby communities, the post was used to display municipal notices.